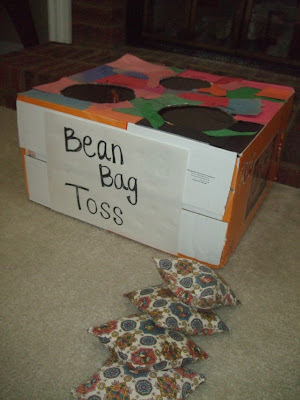 I've been wanting to sew some bean bags for my daughter for awhile. They were very easy to make - a great project for a beginner. I used some old, sturdy fabric from my stash. It actually came from an old rocking chair cushion I just couldn't throw away. The game is made from a diaper box. I traced circles on top and cut with a knife. My toddler helped me decorate it with construction paper. The whole family enjoys this game. 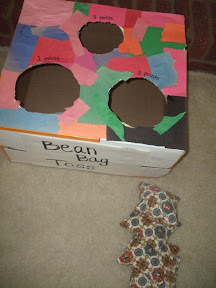 The baby chews on the bean bags, the toddler practices her aim, and the momma and daddy have friendly competitions standing great distances from the box. Not bad for a free craft.